I’m busy, busy making soap for the 2012 Sogn Valley Craft Fair. I’ve been aiming for one batch a day. In the last few days I’ve made a gorgeous loaf of Chocolate Orange with dried oranges, dark chocolate, Calendula petals and Nutmeg, soap balls and soap curls. This morning I made a batch of Rise n’ Shine with one of my favorite essential oils blends of Pink Grapefruit, Palmarosa, Peppermint and Rosemary. I don’t know what it is about that blend, but it’s just intoxicting to me. I’ve also made some of my favorite stand-bys Spearmint French Green Clay and Ice, Ice Baby. And there’s more to come over the next few days. Here’s the postcard for the fair. Just look at that gorgeous artwork. My whole family is involved in this event. The fair takes place on the farm where my husband grew up. My husband and my mother-in-law are on the committee that plans the fair and my mother-in-law is an accomplished potter who sells who her pots at the Fair. My daughter and her friend also make their own line of bath and body products and fancy chocolates and cookies that they sell at the fair.. And my son runs around, making friends all weekend long. I love this Fair. I think it’s really special. It’s wonderful and different to be at an art fair in the country instead of driving around Minneapolis trying to find a parking space. I love the scale of it, it’s smaller than the Stone Arch Bridge festival or the Uptown Art Fair. You can see everything. It’s been carefully juried and the work is high quality. I love the live music, the sunshine in October, the parade past my booth of fashion and dogs and cute babies, the bees buzzing in the air. I love pots and paintings and jewelry and prints but I also love the organic produce, Ruthie’s caramel’s and cookies, the big buckets of raw honey, the pumpkins and Indian corn. 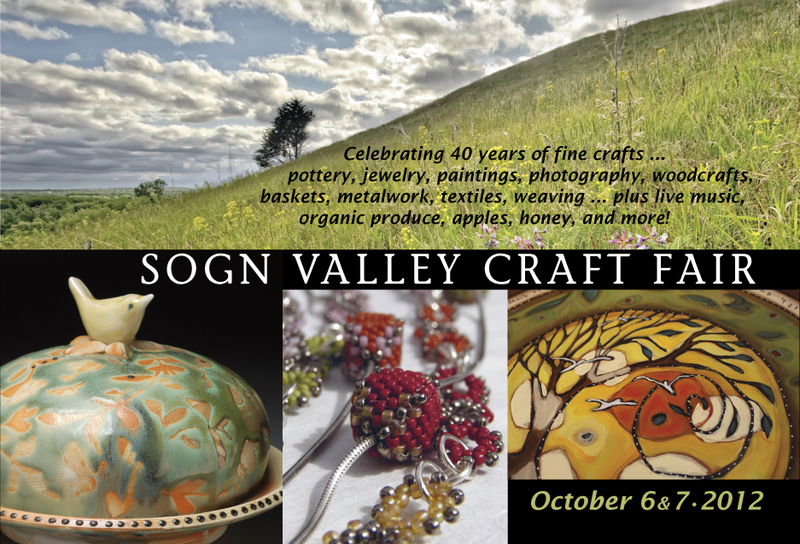 Check us out on the web at www.sognvalleycraftfair.com and stop by and see me on October 6th or 7th.